The CarbonBank™ program from Green4Good is a new and ground-breaking method for businesses and end-users to reduce their environmental impact in an effort to gain carbon neutrality. We are the first company worldwide to offer carbon credits for your end-of-life IT assets. 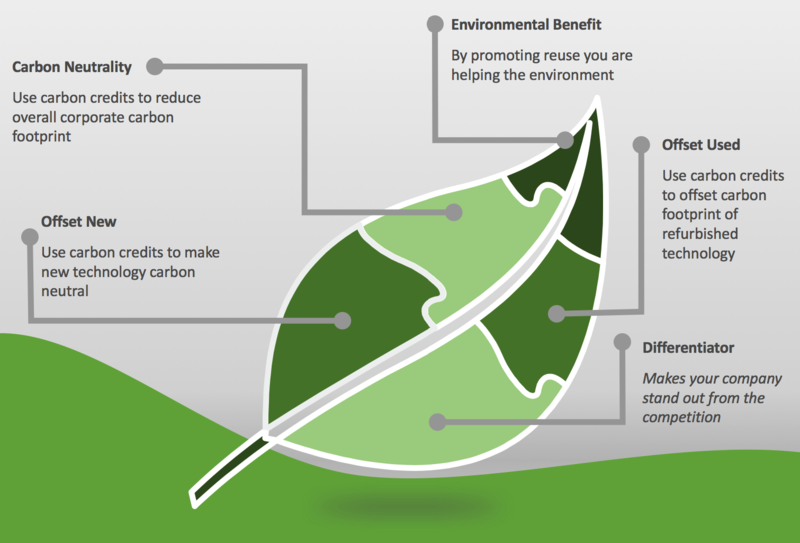 In addition to offering carbon credits, CarbonBank™ has the unique ability to offset your new purchases of IT equipment and make them carbon neutral. Through participation in the CarbonBank™ program, our clients would obtain carbon credits to reduce their carbon footprint & climate impact. An activity that generates a carbon offset is a carbon credit for greenhouse gas reduction. The carbon credit can be used to offset the emissions of another activity or product. Means having a net zero carbon footprint. This can be achieved by offsetting the amount of carbon emissions you generate with an equivalent offset from another activity ( solar panels etc). CarbonBank™ enables industry partners, corporations and consumers to purchase these carbon credits to help offset CO2 emissions. This program benefits business, end-user and refurbisher alike. Most importantly, the CarbonBank™ program is a technological solution for an environmental problem. As we all know, climate change caused by the emission of Greenhouse gases is a very serious global issue. Attempts made by Governments and Corporations to decrease the atmospheric impact of these emissions has led to the development and growth of carbon and reduction related industries. One of these markets is Carbon offsets or credits. All companies add pollutants to the atmosphere however, you can offset these emissions with the purchase of a carbon credit. Essentially, a credit can be obtained when a company offers any sort of emission reduction effort such as energy reducing or efficient retrofits, the use of solar or wind power, or a dedicated asset disposition program like Green4Good. In turn, this allows a company to then become carbon neutral, demonstrating that company’s dedication to environmental sustainability. Quite simply, carbon credits (also known as carbon offsets) are financial units of measurements that represent the removal of one tonne of carbon dioxide (tC02e) from the atmosphere. Carbon credits can be bought to offset the carbon emissions that a party is generating. Carbon credits make up a trading system that creates financial incentives to reduce greenhouse gas emissions. Participating organizations are capped in either a mandatory (government-regulated) or voluntary system. Governments can issue allowances or quotas. Participants that keep your emissions under the cap can earn carbon credits, and organizations above the cap buy carbon credits to offset your surplus of emissions. Thus, for companies or organizations that stay under the cap, there is a financial reward in selling the credits. The farther under the cap, the more financial benefit. The overall goal is to reduce emissions. Part of the carbon credit trade includes the “offset market” – companies or organizations that run greenhouse gas reduction programs, amassing carbon credits and selling them to other companies and organizations. This occurs especially in the voluntary market as companies and organizations are beginning to see the value of greener business practices and emission reductions, especially from a marketing point of view. Projects vary in quality and yield. There are some certification methods, especially in the Kyoto Protocol regulated markets. Generally, quality is determined by additionally, promoter credibility, transparency of processes, absorption or reduction assessments by third parties, well-kept records, and quantification protocols. Who Can Use Carbon Credits? In Canada, carbon credits can be purchased by the government, industries and private individuals to compensate for the carbon emissions that they are themselves generating. In certain cases, purchasing carbon credits can prove to be less expensive than actually reducing greenhouse gas emissions. How Can Buying Credits Help Reduce Emissions? Of course, by its own buying carbon credits will not reduce greenhouse gas emissions since the only way to reduce emissions is by… well… actually reducing them. That being said, buying credits actually plays a very big role in balancing the carbon footprint until more severe, drastic measures to reduce it are implemented worldwide. Why Should My Business Care About Carbon Credits? After learning more about carbon credits it is quite easy to forget about this topic and move on. Going on with your life the way you have always done is much easier than changing something that you don’t like about it. It shows leadership; It makes you more desirable in the eyes of consumers who are environmentally conscious; it helps you prepare for future regulations; It allows you to save money on energy bills. Are Carbon Credits a solution to Climate Change? To Learn more about Carbon offsetting, check out this great article by David Suzuki.